Music can lead people to discover the astonishing appeal of the Man behind Christianity -- that is, of Jesus Christ himself, according to Russian Orthodox Metropolitan Hilarion Alfeyev. The chairman of the Department of External Church Relations of the Moscow Patriarchate affirmed this Wednesday when he spoke at the Catholic University of America in Washington, D.C..
Metropolitan Alfeyev is himself an accomplished composer and he spoke on "Music and Faith in My Life and Vision." The prelate acknowledged that he is "well aware of the insignificant number of young people who listen to classical music, whereas almost everyone listens to popular music." "This," he said, "I consider to be a real tragedy." But, he affirmed that "secular musical art is possible within Christianity, including that which exceeds the limits of classical music which I love so much." The metropolitan called Christianity "inclusive," saying, "it does not set strict canonical limits to art. Christianity can even inspire a secular artist who, using the means available and known to him and his milieu, will be able to convey certain sacred messages equally in the language of modern musical culture." By way of example, Metropolitan Alfeyev cited "Jesus Christ Superstar." "No doubt," he said, "this composition is not in keeping with church criteria, but the author did not purport to present the canonical image of Christ. He achieved his objective outstandingly well by telling the story of Christ’s passion in a language understandable to the youth and through the medium of contemporary music." "I appreciate this music more emphatically than I do the works of many avant-garde composers, since the latter sometimes eschew melody, harmony, and inner content," the metropolitan reflected. "The image of Christ can inspire not only church people, but also those who are still far from her," he added. "One should not forbid them to think, speak and write about Christ, unless they are moved by a desire deliberately to distort Christianity and to insult the Church and the faithful. "If a composition is bright, impressive and grips the listeners, if it makes them empathize emotionally with the Gospel events and even weep, if it arouses profound feelings in them, then it deserves high praise." 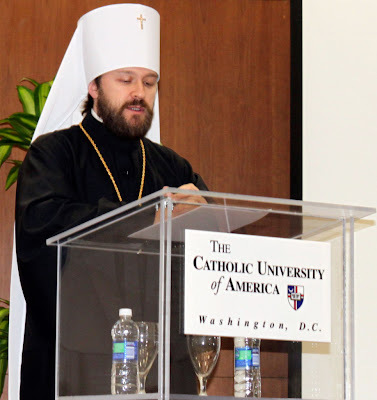 Metropolitan Alfeyev observed that the path to Christianity "often begins with a discovery of the living Christ, rather than a recognition of the church’s dogmatic truths." "Christianity is a religion focused on the living Man, a historic person," he said. "The person of this Man appeals astonishingly. It may well be the case that a composition on a Gospel subject, though written by a non-Churchman, is imbued by a veneration of Christ. Many may begin their way to Christ and to the Church through such a composition, even if it were not altogether 'canonical.'" Read the full text of lecture here.